The ECB LTROs seem to suggest a willingness and ability on the part of the ECB to prevent failure of major financial institutions. That in turn suggests a "Japan-style" resolution for the European imbalances - a long period of stagnation and zombie banks slowly working their way out of trouble rather than a "great depression" style resolution with a cascading series of institutional failures. That in turn suggests continued gradual recession in the European economy, rather than abrupt contraction. Thus the continued loss in European oil demand would be gradual. Rather strong US economic numbers in recent months seem like more than just a failure of seasonal adjustment post-great-recession and suggest that the US really is recovering at a slightly better pace. Auto sales are recovering well, and all this is bullish for US oil demand. The Saudis have suggested that $100 is a fair price for oil. 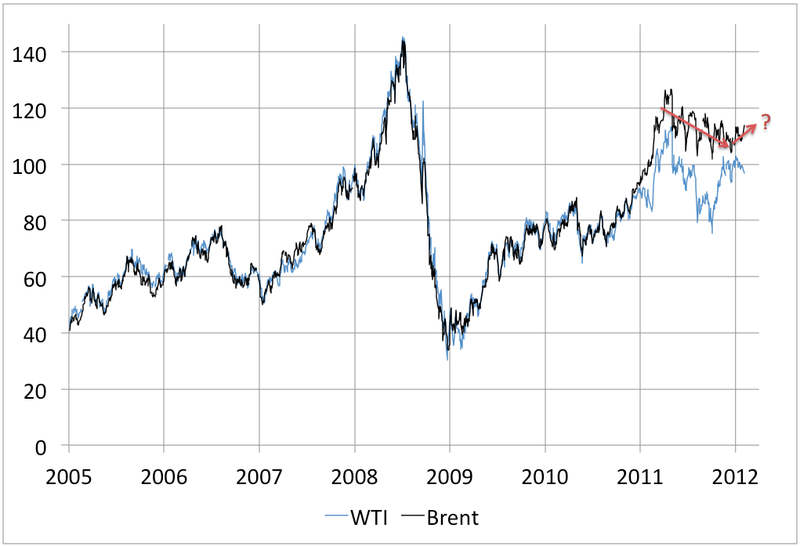 Brent is not far above that now (and Saudi grades generally trade at a discount to that). 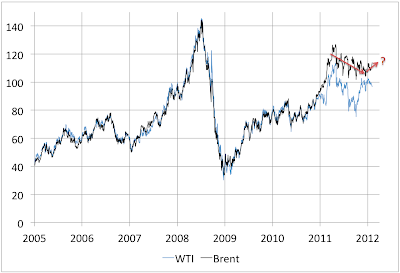 This suggests there is not much room for oil prices to fall further without triggering a reduction in Saudi production. In turn, I doubt the Saudis have much capacity to expand production. The situation between Iran and the rest of the world continues to deteriorate. Israelis like to say that when it comes to military and security operations, those who know don’t talk, and those who talk don’t know. But the intense and increasingly public debate about whether to attack Iran’s nuclear facilities is challenging that piece of conventional wisdom. The standard view has been that successful attacks rely on secrecy and surprise, so the more talk there is about an operation, the less likely it will occur. One year ago, Prime Minister Benjamin Netanyahu seemed to support that theory. He told foreign journalists that Iran briefly stopped working on a nuclear weapon only once, in 2003, because that was when the United States attacked Iraq, and Iran feared it might be next. In other words, the more noise you make about war, the less likely you will have to resort to it. But few who have spent time with Israel’s decision makers in recent months have come away believing that the talk of a military assault is merely a well-scripted act of public diplomacy. It is that, to be sure, but there is more. It is also a window into the government’s thinking. This kind of thing is extremely difficult to evaluate - it comes down to the ability of individual reporters to correctly discern the true beliefs and intentions of sources who are explicitly trying to manipulate the press ("No, no, this time we really mean it!"). Anyone who's been following politics for any length of time is aware that scares about some combination of Israel and the US attacking Iran show up in the press every year or so, and so far none of them have come to anything. Seymour Hersh has been issuing regular alarm calls since at least 2005. Still, the more I've thought about it, the more intractable this situation seems to me. If I was an Iranian leader, I'd be looking at the fate of the regimes in Iraq and Libya and now Syria and thinking the only thing that would prevent outsiders trying to do the same thing to me would be nuclear weapons. I'd also be aware that I'd recently had to steal an election and then viciously suppress the protests in the aftermath, and I'd be well aware that there was plenty of internal dissent that the outside powers could work with. And I'd also be very well aware that foreign powers were assassinating my scientists and blowing up my missile plants. So I'd be doing everything humanly possible to advance my nuclear weapons plans as fast and as secretly as I could to get myself into the situation where nobody could mess with me or threaten me any more. And correspondingly, if I was an Israeli leader, I'd be looking at Iran arming Hezbollah on my northern border and doing everything they could to arm Hamas on my southern border, and periodically making extremely intemperate statements questioning the very existence of my nation, and I'd be thinking that it would be extremely dangerous to let these people have nuclear missiles and that it would be worth a very high level of risk to try to prevent that. And that would be my number one policy priority and I'd be doing everything I could to bring about the conditions in which I could remove that threat with the minimum backlash. Thinking along these lines suggests to me that it's more a matter of "when" not "if" the thing spirals out of control. The Obama administration will have no interest in sparking a giant oil shock in an election year, and has been communicating that forcefully to the Israelis. However, it's far from clear that the Israelis will share that motivation. Why not put the US President in the position where he has to either back them up (eg by suppressing Iranian retaliation in the Gulf of Hormuz) or look weak and feckless in dealing with the hated Iranians, something the Republican candidate will be happy to campaign on all year? All that's needed is to first go through the motions of giving all possible sanctions time to fail so they don't look too crazy to world opinion. This is highly speculative of course. It's entirely possible the Israelis are bluffing at present and will wait longer. I guess I just think there's a way in which everyone's plausible deniability is eroding. The last IAEA report removed pretty much any residual doubt about the Iranians' good faith and honest dealing on matters nuclear. And the series of explosions and assassinations in Iran has been getting longer and more blatant. At some point, the pretense that this is not a war becomes unsustainable, and once people stop feeling the need to pretend, things could worsen quickly. At least, that's my gut feel. I could, of course, be completely wrong. In particular, it's still clear that Europe has no credible solution to the plight of Greece, Portugal, etc, and that's likely to lead to various explosions as the disorderly adjustment process continues. You've argued that our capacity to conserve should not be underestimated. Could we be seeing some real change in consumer behavior here? Or less benign forms of 'demand destruction' associated with imminent recession? Thanks for an excellent analysis. I am personally appalled at how much we are in the Israeli pocket on this issue. All this brinksmanship reminds us of the runup to the Iraq war. Which turned out so well. The thing is that a nuclear weapon is far less dangerous than all the Israeli chicken littles claim. Has Pakistan used its bomb? Has the Pakistani bomb insulated them from internal strife and insurgency? Did it prevent us from conducting military operations on their soil? No. It really makes no difference whatsoever, apart from nationalist propaganda value. Our wisest course would be to cheer them on, and say that we have no intention of attacking Iran, but at the same time will contain their external influence and promote internal reform towards real democracy with all our many other resources. If it comes to the Israeli crisis that you see coming, (as I do too), I certainly hope that Obama cuts them loose and forges a more equitable and moral policy in the middle east as he originally promised, concentrating on the enormous gains of the Arab spring and the nascent leadership of Turkey ... over the old melodramas. Contrary to most expectations, I think an Israeli attack is extremely unlikely. 1. The dog that barks doesn't bite. Previous Israeli attacks to foil nuclear projects in Iraq and Syria were not preceded by long publicity campaigns. It makes no sense to have the debate so much in the open if they mean business. 2. Contrary to his image, Netanyahu is extremely cautious when it comes to using military means. He does not share the adventurism of his predecessors (Barak, Peres, Sharon, Ulmert) all of which were involved in large military operations / wars. While Netanyahu - notwithstanding his nationalist rehtoric and positions - has kept out of this kind of trouble. This is no accident. 3. An oil shock, blamed on Israel, would be extremely risky to a state that depends so critically on North American and EU support. I find it hard to believe that the Obama administration will let this happen. They can just say: don't do it. And I'm pretty sure they have. 4. Israeli officials admitted that a military strike would have limited impact on Iran's nuclear programme. To summarise: as you know well, an attack could see prices jump by 50% or even double. This would sink the world's economy. It is not going to happen. The real question for me is whether the EU embargo is serious. I think we are talking about half a million barrels per day to the EU from Iran. That is probably replaceable from the Saudis - perhaps you disagree, Stuart? - but will have upward pressure on prices, which would not be welcomed for an economically struggling Europe. So I don't quite see why now (it is scheduled for June but still). One could assume there is an orechestrated bluff here, but what is it geared towards?